In recent years there has been a significant spike in the number of online startups who trade solely through online platforms and ship mattresses direct to the customer, which removes the need to visit time-consuming showrooms. Eve Mattresses are one of these businesses, but the question is how comfortable these mattresses are? And can a mattress that comes compressed in a box be as good as the traditional showroom mattress? It can be challenging to decide whether a mattress will be suitable, especially when you can only buy it online. We have created this in-depth Eve mattress review guide to evaluate whether the mattress lives up to the hype and if it will be suitable for your individual needs. Eve mattress is a UK based mattress manufacturer/retailer, and although they are relatively new to the market, the product has been in the development stage for over ten years to ensure that when the product finally was available for purchase that it was as great as possible. 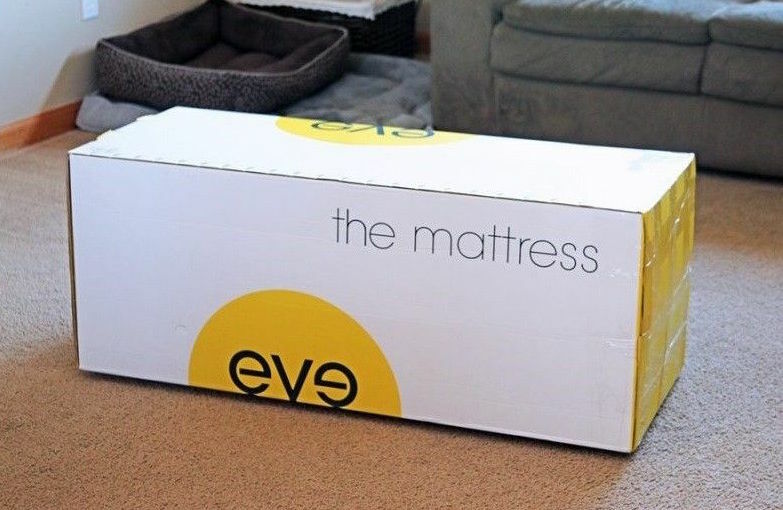 As a result of cutting out the retail stores, an Eve mattress retails considerably less than its showroom counterpart but also provides a high-quality sleeping experience. The popularity of these direct from factory mattresses is growing massively, and it wouldn't be surprising if soon showrooms up and down the country began to close one by one over the next few years as we are amid a truly digital age. By the end of this Eve mattress review, you will discover whether this mattress is highly effective and if it will suit your sleeping style, or whether their reputations built on unwarranted hype. Do you want to see more mattresses that we review? Click here for highest rated. We're in a world where mattress buying is not easy, and each one comes with numerous options and add ons, and the whole process is very time-consuming. Eve Mattress have tried to solve this with a one size fits all solution to remove the jargon and complication to help you avoid the traditional pushy showroom salesman. The mattress is made up of three foam layers which are then surrounded by a plush type fabric to finish it off. The first layer under the cover is a 4cm layer of responsive memory foam which has been designed and included to provide support and comfort to your body. Memory foam reacts to changes in temperature so when you lie down it works to contour to the shape of your body to relieve pressure points. This memory foam layer leaves you feeling refreshed and well rested when you wake in the morning. The memory foam also absorbs movement, so if you sleep with a person who moves a lot during their sleep, the other person will not be disturbed. A common complaint from memory foam users is that the material gets hot throughout the night which then makes it uncomfortable to sleep on. Eve Mattress has attacked this problem by featuring a 3cm cooling layer that is constructed using a material that is 30% more breathable than traditional memory foam, which will decrease the amount that you sweat throughout the night. The remainder of the mattress is built using a thick layer of super resilient base foam, and its high-density properties ensure that the mattress has a robust and secure foundation to provide your body with the support that it needs. When you sleep on the mattress, you really can feel the supportive aspect of it. The mattress is finished off with a lovely plush stretch polyester cover which is soft to lie on but is also hypoallergenic and hard wearing, so it's also durable. The cover is a distinctive yellow colour that you have no doubt noticed in all the marketing content. The cover also has unique airflow qualities which makes the mattress breathable and allows for air to circulate efficiently. For added peace of mind, the cover is also Oeko-Tex certified which means that it has been proven not to include any harmful substances found in poorer quality mattresses. As someone used to being dragged from showroom to showroom having to dodge salespeople who are hungry to hit their target. This was an unusual feeling to be ordering online however it was hugely relieving to be able to complete the transaction in just a couple of minutes and allow you to pay via credit/debit card or Paypal. From this point, you can kick back and wait for your mattress to be delivered via courier. The product is received within three days, and unlike ever before if you aren't home, you could get the mattress delivered to your work. How often have you been able to say that about a mattress? The mattress comes compressed and vacuum packed into a relatively standard sized box that you can carry to where your bed frame is. You won't be able to believe that they can fit such a large mattress into a medium-sized cardboard box. This is one of the best parts of the process because usually, I'd have to struggle to push the mattress up a staircase and round a tight corner. Once the mattress is removed from the box, it does need a few hours to expand into its full size. Like most mattresses that contain memory foam, there is an initial slight rubbery smell so the windows may need to be opened for a few hours until the smell disappears. If you have previously had a memory foam mattress, then this smell may not bother you as much. This is the most important thing, isn't it? Eve has created a high-quality mattress, and you can feel this when you sleep on it. Although they have replaced the latex layer that is traditionally used, the new springy layer feels slightly superior and stops you from sinking into the mattress which has been a common complaint from memory foam users. It does create a snug feeling but with the necessary support to relieve pressure points. Eve has tried to make a one size fits all mattress so the firmness is around 6-7 out of 10 so if you require a very firm mattress then this may not suit you. Unlike pure memory foam mattresses, the cool layer in the Eve mattress does create a noticeable cooling effect, so you're not woken up by the mattress overheating even if you sleep with a thick duvet. This cooling ability will make it great no matter whether its summer or winter. Like advertised the outer plush layer is exceptionally comfortable and soft to touch, and it was tempting to sleep on it without even adding a cover. The mattress is extremely surprising as you initially think that it's a bit of a gimmick and can't be as good as mattresses that are double the price, but it does provide a comfy sleep. The mattress doesn't use any revolutionary design or material but what it does do is executes it better than most other mattress companies by using the highest quality materials, and you can tell that the mattress is built to last. The firmness of the mattress will allow you to feel the spinal support which is especially beneficial for back and stomach sleepers. So when you wake up in the morning, any real aches and pains will start to disappear. Although it has not been put through any conclusive studies, many users who have suffered from back pain have reported that the Eve mattress cured the problem. It is important to note that it may not instantly transform your sleep, and in some cases, it can take a few nights of sleep to fully begin to feel the benefits. This is why the 100-day guarantee is so important. To allow you not to rush and give it a prolonged period of testing without jumping to conclusions about its effectiveness. One of the main things that have gained Eve mattress added publicity is the 100 day trial period. This means that you can use it for 100 days and if you still don't like the product you can contact them and arrange a collection and receive a full refund with no questions asked. This trial period is hugely important because for the first week or so you may not enjoy sleeping on the mattress, but as your body gets used to it you begin to enjoy it. Whereas if there is only a 7-day guarantee you may have sent the mattress back thinking that you didn't like it. Also included with all purchases is a 10-year guarantee that covers any physical flaws, including the cover, that results in the mattress losing shape caused by normal usage and correct handling. General wear and tear are not included in the guarantee. It must be noted that the average mattress should be replaced every 8-10 years, so this guarantee is more or less safeguarding you against this. The Eve mattress is considerably lower priced than similar mattresses made by competitors. The price point of the mattress represents value for money and is fair considering the benefits that it brings. The great thing about the Eve mattress is the minimal motion transfer which is hugely important if you share the bed with a partner. When using the Eve mattress if you're a sleeper who moves lots during the night then the movement will not be transferred to your partner who will not be disturbed. Staying true to their one size fits all motto, the Eve mattress is suitable to be used on all types of bed bases including divan, slatted, box springs, adjustable beds and can even be placed by themselves on the floor. Not only is the Eve Mattress designed in the UK, but it's manufactured and assembled right here within our borders, which is great to hear so if you enjoy supporting UK businesses then it doesn't get more homegrown than an Eve Mattress. The mattress provides the optimal level of sinkage where you do feel snug but not overwhelmed because of the underlying firmness of the mattress which gives it some bounce. The cooling layer prevents you from overheating which is a common situation with traditional memory foam which you can now avoid. So even if you sleep with a duvet, you will still get a comfortable disturbance-free nights sleep. Many people don't like dealing with online companies because they feel detached and unable to get the necessary support when they need it. But with Eve mattress they are there every step of the way from when you first visit the site and have a live chat feature that you can instantly use. But they can also be contacted by phone if you prefer to speak to a human voice. Of course, the fact that you can't lie on the mattress is still a drawback even with the money back guarantee, but the guarantee does make it much more acceptable. But the reviews do speak for themselves, and the response from actual buyers has been extremely positive which shows with over 20,000 mattresses sold to date. I love companies that remove the risk from purchases, and with the 100-day risk-free guarantee it means you can easily purchase the bed to test, and if it doesn't suit you, you can then return it. Not many mattress companies allow you to do this and I don't think you will regret trying the mattress because it is extremely comfortable. It's important to note that 95% of Eve mattress buyers keep it beyond the 100 day trial period. You spend over a third of your life sleeping, so it's essential to get a mattress that provides the highest quality sleeping experience.